It’s one of those places that if the guide books didn’t tell you about it, you’d blink and miss it. Off Shukri al Quwatli Street where services, taxis and other cars jockey for position under clouds of exhaust fumes and sand, and then behind the military museum where old planes in grey, khaki green and camouflage are beached for viewing pleasure, lies the Takiyya As-Suleimaniyya, a Turkish architectural oasis of cool breezes and serenity. Stepping down the stairs through one of its two obscured entrances is like slipping into a trance. Vines and hanging plants hover overhead creating a covered walkway, leaves rustling in the light breeze. Jewellery, leather bags, scarves and carved wood products sparkle, glint, and attract from the window displays of the different artisans shops. It would be easy to get caught up haggling over an exquisite necklace or bargaining for another gift, but keep moving to the middle of the lane and turn one more corner. 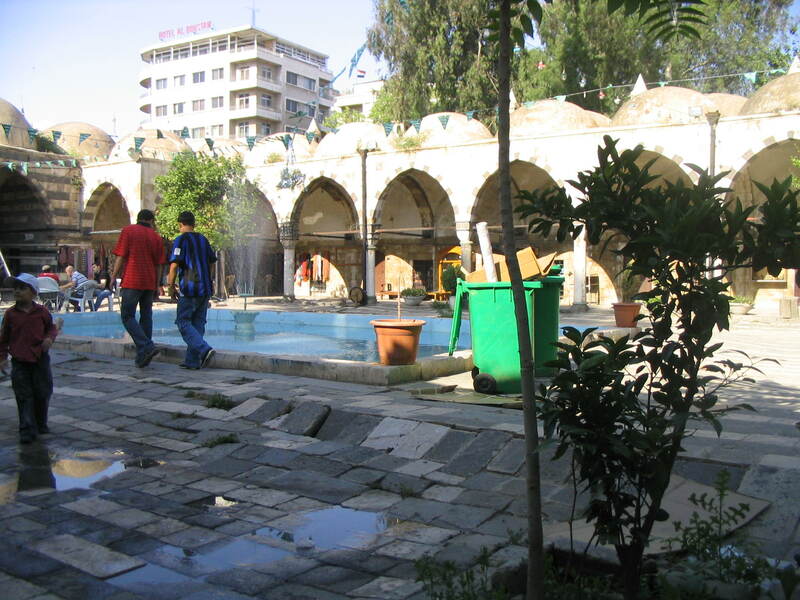 Hidden here is one of Damascus’ architectural oddities, a stone courtyard resembling the waves of the ocean. The foundation is sand and through the years it has shifted the rocks on top of it until they roll up and down from one end of the courtyard to the other. In the center is an atypical drained and silent fountain as the defect in structure prevents it from retaining any water for longer than a few days. At the very end is a mosque, serene and relaxed, unlike Omayyid where worshippers and tourists bustle together in droves. 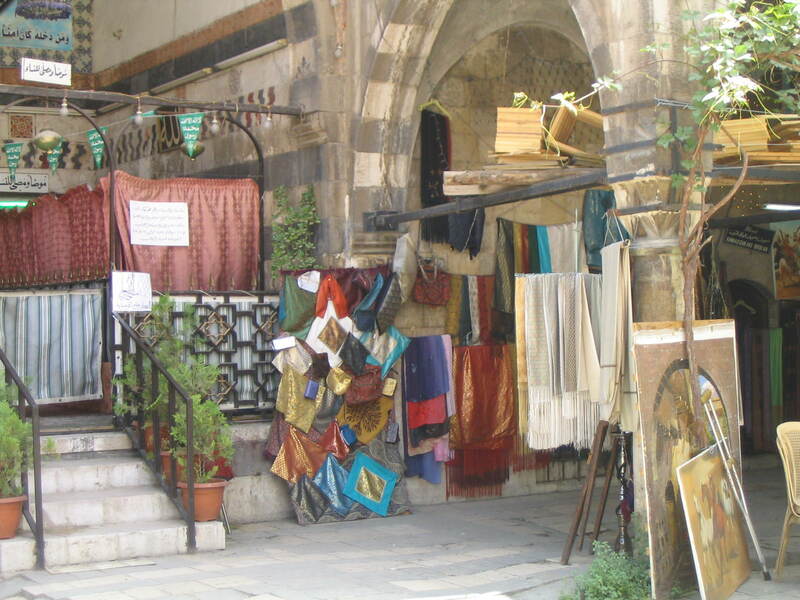 Move to the shaded porticos surrounding the courtyard to where the foundation is more solid, and here you will find the Artisanat, Damascus’s handicraft market. On one side of the courtyard classical music is playing, belying the elderly shopkeeper inside. On the other, Arabic pop music blasts from the glass shop of a much younger artist. 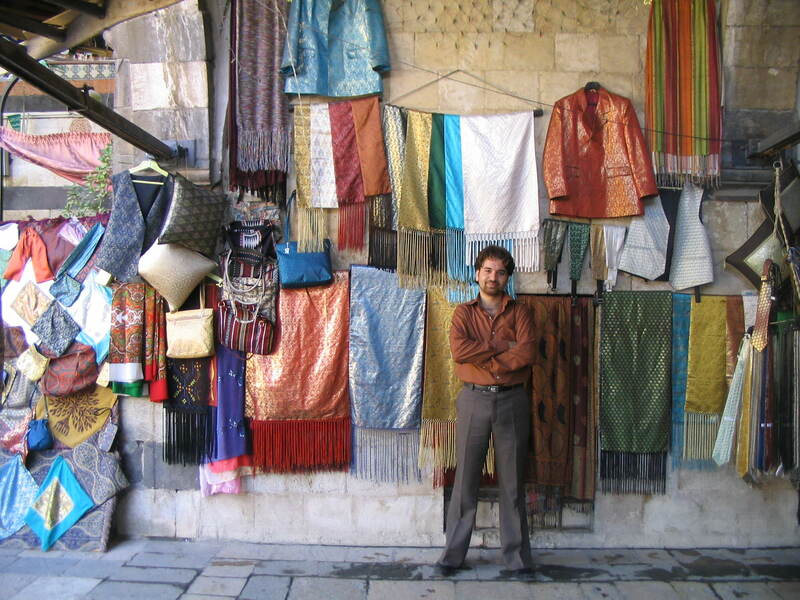 And tucked away in the very back corner, quiet and unassuming, is one of the last shops in Syria featuring handmade brocade, an elaborate and intricate fabric woven from silk threads. It’s full-time weaver is 22-year-old KinanTafish, a soft-spoken and gentle young man, who has been working here since he was 15. He is quite possibly the last artist of his kind in Syria, and he is trying to hold the death of his art at bay for as long as he can. Like most young Syrian boys who have time to fill during their summer months and want to earn money to help out at home, Kinan started looking for work. His uncle asked around the shops in the Artisanat, and one in particular was looking for a shop assistant. Kinan got the job after he claimed to speak good English. He didn’t really, but he knew enough to tell the tourists the prices they’d be paying. For the next three years he spent his time as the go-to boy for cleaning, making tea, and rustling up the tourists, all the while watching his boss at the loom weaving the brocade that filled the shop with vibrant colours. By the time he was 18, Kinan was in love with the brocade. His boss’s partner at the time convinced the young boy to come work for him on a brocade machine in Jaramana. He worked there for about two or three months but didn’t learn anything about the art, spending his time cleaning the floor in the shop. His old boss found Kinan and wanted to know why his former employee was working there when he could easily get his job back in the Artisanat. He thought he would have to win Kinan back by luring him with the common Syrian phrase, “Whatever you want or need, come to me.” But Kinan didn’t need any tempting and his response was, “I don’t come here just for the money. I want to learn this work.” His boss was more than impressed; until then none of the boys who had worked in the brocade shop had wanted to learn how to make it themselves and Kinan was quickly reinstalled. But the desire to weave didn’t fast-track his learning. His boss didn’t have much time to teach his new apprentice the art of brocade. He often had to leave the shop to deal with tailors or attend to other business. Kinan was only able to intently watch the whole weaving process – threading the needles, choosing the patterns and colours, operating the loom – in action about three or four times. The rest of the time he was focusing on sales. What he did know about weaving he would practice after he was alone in the shop, but it still wasn’t enough. After a few frustrating months, he threw up his hands and said he was leaving. It wasn’t an idle threat, one his boss fortunately recognized. 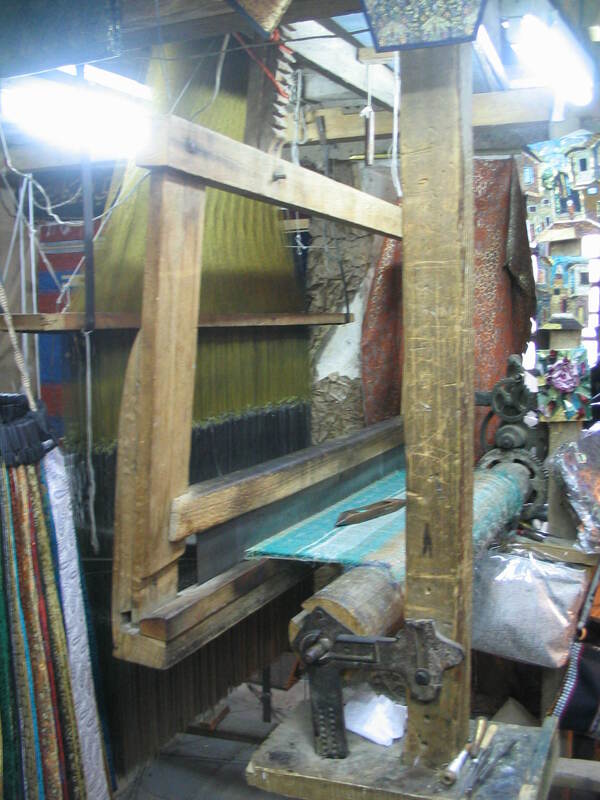 His response was, “Ask.” So Kinan started asking, asking why the threads went here or there, asking how the machine on top manipulated the threads on the loom below. Three years later, many of his questions were finally answered; he now owns 25% of the shop and works full-time as the weaver in residence. “After three years I know something, but even now I still need to learn more. The work is very big, like the sea,” he explains as he brews yet another pot of tea for an interested buyer. And the work is slow. It’s his art, but it’s still a shop and so daily his weaving is interrupted by tourists, errands, and the other things that are needed to make a business work. On a busy day, Kinan can only finish about 25cm of brocade, and that takes around 4 hours, amazing when you look at the crowded bolts of fabric on the shelves behind his display cases. 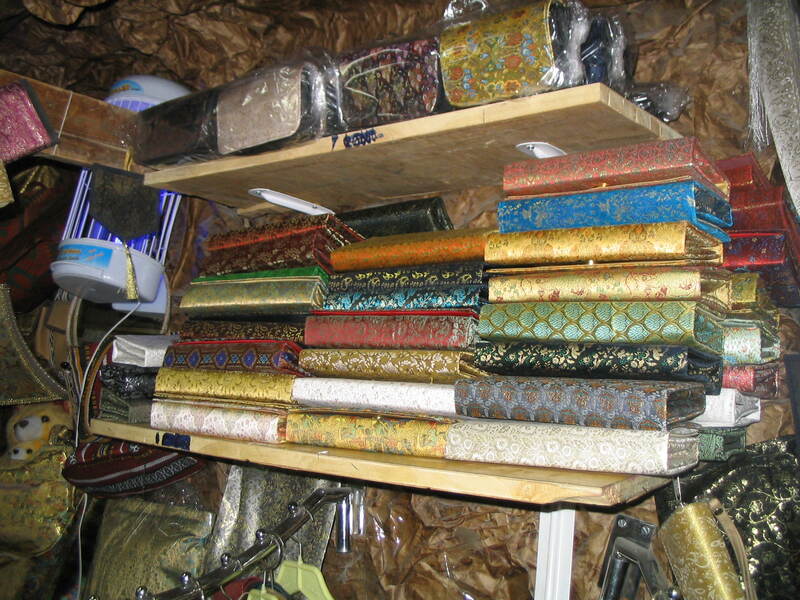 The shop is stuffed with the fabric and everything he makes from it – purses, wallets, covered boxes, jackets, ties. Turquoise, burnt orange, wine, saffron, emerald green, and hundreds of shades in between flash and change hue as the light hits the colours from above. But the dominating feature takes up the entire back corner, a 100-year-old loom, his literal bread and butter. It’s not the largest machine you’ll ever see, but it is impressive. Between six and eight thousand heavy-duty threads run vertically from the needles to the machine above, a cast-iron device called a jakar. It holds the patterns and manipulates the needles and threads below. The same number of fine and translucent silk threads run horizontally from the back of the loom, through the needles, to the front, where Kinan claims you need a certain touch of magic to weave in the beauty. Fortunately he doesn’t need to replace the vertical threads all that often, maybe once every ten years. But the horizontal threads are another story. They hold the coloured threads together, giving stability to the fabric. They’re about 50-100m long and get used up every 3 months. After they’re gone Kinan needs to call in a friend and in a process that takes about a day, they work together to re-thread thousands of needles by hand. Six thousand silk threads are the minimum needed to produce a fabric with three colours, the number Kinan likes working with the best for its simplicity. If he wants to make a much more elaborate pattern with 7 colours, he needs 8,200 threads and a partner to complete the work. And even though that sounds like hard work, it’s easy compared to the past. 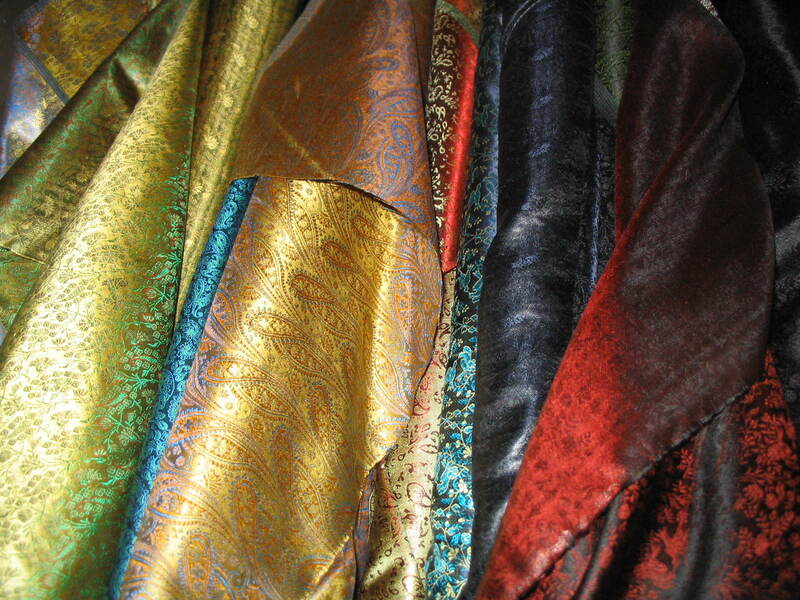 Before 1850, it would take at least two people to make brocade. One would be on the floor operating the pedal and shuttle, weaving the colours together. The other would stand high up above the loom, holding onto 100 threads and pulling them up and down depending on the pattern, a puppeteer to the marionette of fabric being woven below. The work was too laborious for complex patterns, and the material would have been a mixture of silk and synthetic threads since 100 silk threads weren’t enough to make a durable brocade. 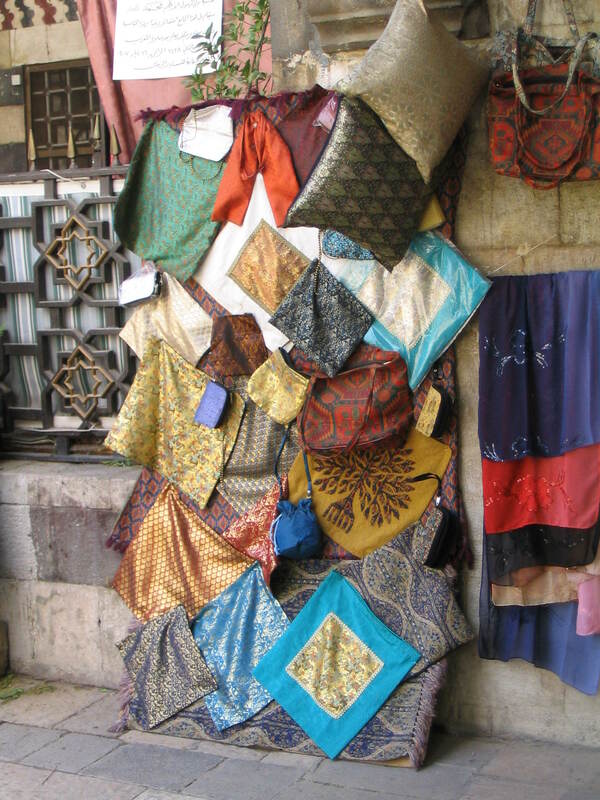 The patterns would have been simplistic in comparison with what you see in his shop today. But as the machines modernized, the process became faster and easier. More threads could be used and new patterns emerged, contributing to the 30-35 designs still in existence today. 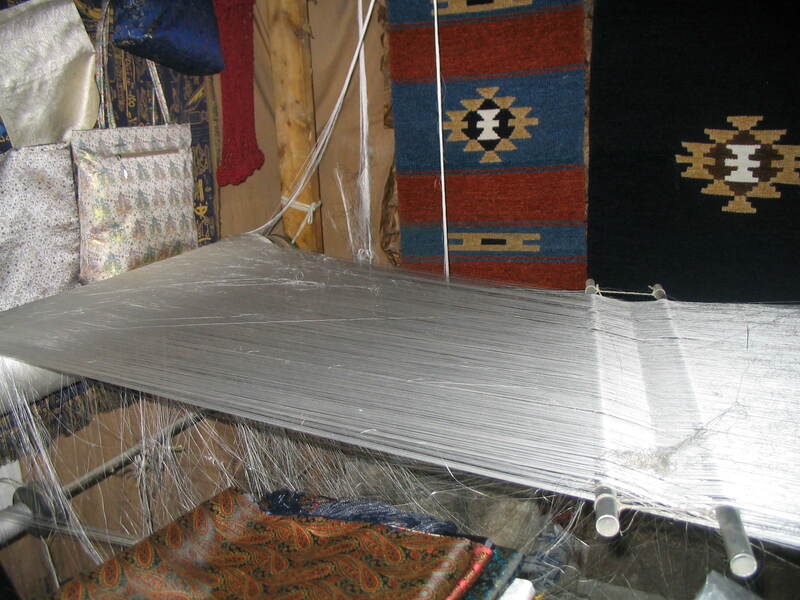 By the 1940s, there were about 250 handmade brocade looms in Syria and 1200 weavers . The hundreds of threads on the loom. 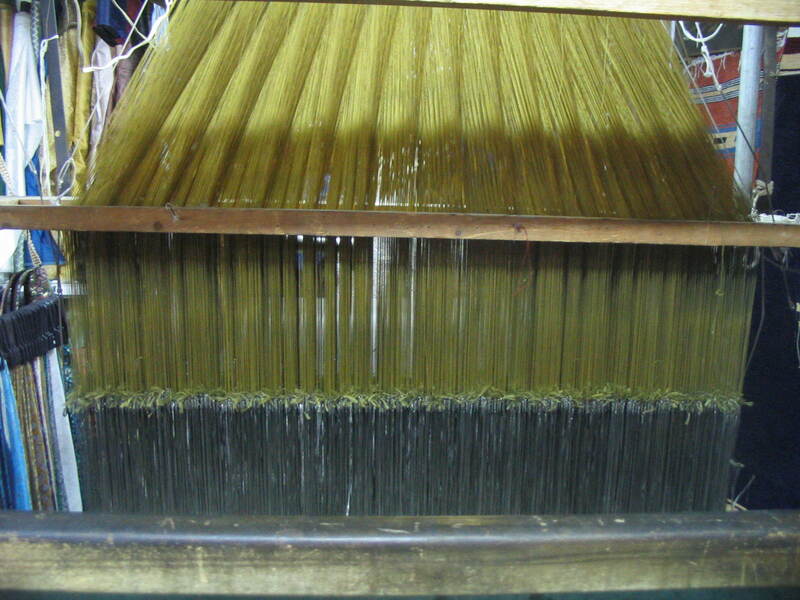 Top end of loom feeding into the pattern guides. Everyone in Syria loved the brocade, it was the fabric of choice for brides who would often buy material for at least two wedding dresses, one in white and gold, and the other in a vibrant colour. But then the inevitable happened. Between the 1950s and 60s, new fabrics came on the market, and trendier patterns for clothing came out. Brocade was losing its popularity and was deemed old-fashioned, and for the next 30 years there was no demand for it. The weavers were aging, some died, others who worked in the profession solely for the money lost interest and left the business. By 1990, there were only 5 machines and 7 weavers left, one of whom was Kinan’s boss. 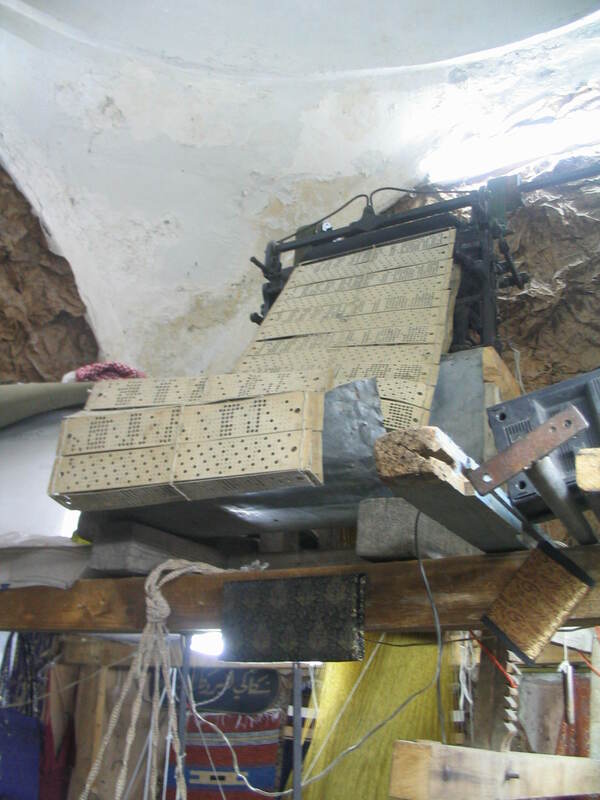 And now in 2007, there are only two machines left in the whole of Syria, one in Kinan’s shop and the other in a shop near the Omayyid Mosque. Woven and ready for use. He also views the job as his ticket to the world. 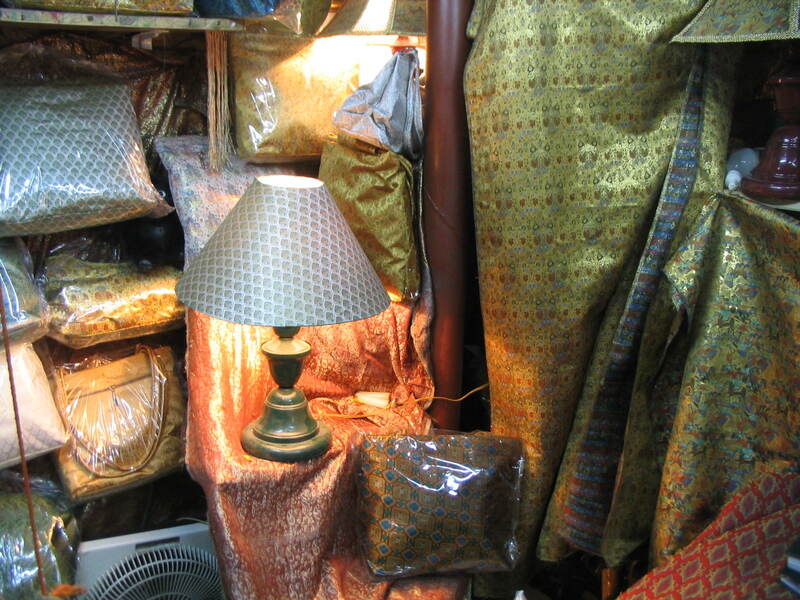 He can use the brocade to travel to exhibitions and fairs, seeing other countries while selling his brocade. While Syrians may not appreciate the fabric anymore, Kinan knows his market is with the foreigners who love anything handmade. He’s already been to Oman for one exhibition and he dreams of attending others in Germany, Italy, and France. And the language is not an issue for him anymore. In all the years of selling and working amongst foreigners, he’s been listening and talking as much as possible in English. Now he can converse easily with anyone who comes into the shop to browse and ask questions. Within the month he should have a computer set up in the shop and he’ll start designing his webpage to broaden his market. 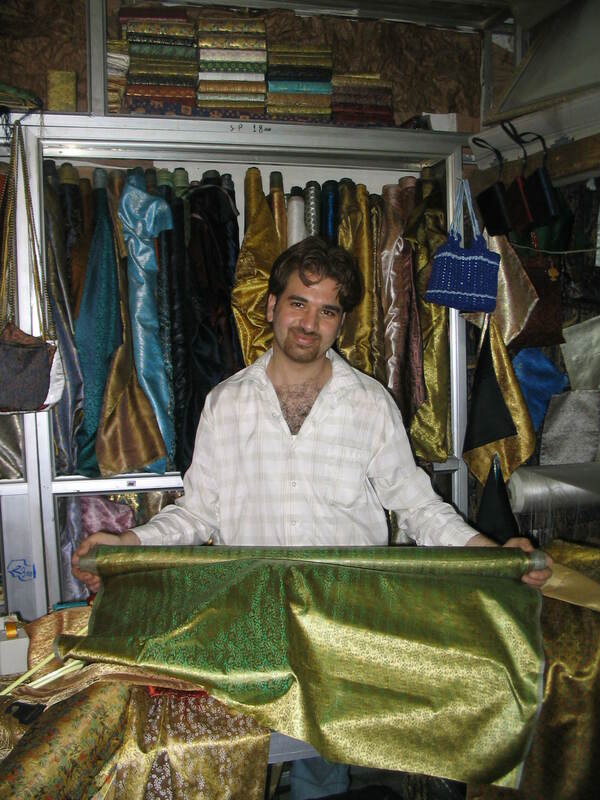 It may be a long shot, but with his determination, hard work and passion, Kinan might just be able to keep handmade brocade around in Syria longer than anyone thought.